What has happened to historical revisionism about the Zionist-Arab conflict demonstrates the truth of the cliché that there can be too much of a good thing. Clearly, the tidal wave of pro-Zionist and pro-Israeli writing, in Israel and the West, in the wake of the Holocaust and the somehow miraculous (and fitting) birth of the State of Israel was bound to be overtaken by a more critical and balanced appreciation. The opening of the archives in Britain and the United States—and in Israel in the 1970s and 1980s, not matched by any similar opening in the universally authoritarian Arab world—helped to underwrite that more true and nuanced assessment of what transpired in the decades following the arrival of the first Zionist immigrants on the shores of the Holy Land through the years of the emergence of Israel. Now we are witness to a veritable tsunami taking that revisionism to shores and provinces that go far beyond what the available documentation indicates or allows, creating a destructive current that is underpinned by invented and spurious narratives and non-facts presented as truth. In his new book, Kai Bird presents us—perhaps unconsciously: he certainly means well—with the latest of these concoctions, based not on archival research but in large measure on a slew of specious histories and, in smaller part, on fragmented memories and parental letters from his childhood and his youth. The original revisionists were academic historians. Their work then filtered down to a stratum of popularizers, journalistic historians, and amateurs, who cull from the serious and not-so-serious histories for their political purposes. Crossing Mandelbaum Gate is of this derivative breed. The book mixes autobiography, relating Bird’s early years as an American diplomat’s son in East Jerusalem, Saudi Arabia, Beirut, and Cairo, with background discussions about the wider historical developments in the region from the 1950s through the 1970s. Lengthy chapters deal with Saudi Arabia, Egypt, and Jordan. But the core of the book, the theme Bird opens with and returns to repeatedly, is the Zionist-Palestinian conflict. He seems to believe that it is the axis on which all modern Middle Eastern history has turned. Bird traces the shift from the ideological and emotional highs of modern secular Arab nationalism in the Nasserist 1950s and early 1960s to the post-1967 regression to a backward-looking redemptive Islam, and devotes long pages to the Palestinian-Jordanian Hashemite struggle of the late 1960s and early 1970s, and probes the ups and downs of Saudi absolutism and Islamism over the decades. It has not been a linear progression, but clearly the fundamentalist insurrection in the Grand Mosque in Mecca in November 1979 and the attacks of September 11 two decades later changed the course of the story dramatically. But always Bird returns to the Palestine conflict, as if it was the key to understanding all the wider dramas of the region. In some ways, it was. The Six Day War, in 1967, heralded the death of the hope in secular nationalism throughout the Arab Middle East. And the rise of (the Sunni) Hamas in Palestine and (the Shi’ite) Hezbollah in Lebanon at least matched, if not slightly preceded, the burgeoning tide of fundamentalism that has swept the Middle East and areas east during the past decades. Moreover, the impact of the conflict over Palestine has not been limited to ideological trends and tenets: methods of activism and violence—such as suicide bombing—have also spread from Palestine’s borders to other parts of Dar al Islam and its blood-soaked marchlands. At the start of his book, Bird tells us that he set out “to understand why the Middle East of my childhood seems stuck in endless conflict.” His answer in large measure seems to be: Israel. It sounds a bit like the complaints of American generals about their current problems in Pakistan, Afghanistan, and Iraq, all of which, of course, have nothing, or almost nothing to do with “Palestine”, though Islamists will trot out that magic word whenever it suits their purposes, and gullible, or anti-Semitic, Westerners will continue to eat it up. The truth is that Islam and Islamists have a terrible problem with the West—its success, its values, its reach—and Israel is only a small part, and not the core, of this detested foreign reality. The Concise Oxford Dictionary defines “paranoia” as a “mental derangement, especially when marked by delusions of grandeur, persecution, etc.” Towards the end of his somewhat rambling book, Bird writes: “Armed struggle was the worst tactic the Palestinians could have used against a whole society marked by trauma and paranoia.” I see his point. But one may easily question it. Viewed historically, “armed struggle” has substantially furthered the Palestinian agenda. Palestinian terrorism and semi-armed and armed insurrections brought the Palestinian problem to the top of the international agenda, where it still remains, and forced Israel to relinquish territory (the Gaza Strip and parts of the West Bank) and abandon traditional policies (it agreed to negotiate with the PLO and accepted the creation of a Palestinian state). But its historical evaluations aside, what really caught my eye in Bird’s sentence was the word “paranoia.” Israel is the sovereign state of the Jewish people. During the previous two thousand years, on and off, the Jews, in their lands of exile, were discriminated against, persecuted, and murdered by their pagan, Christian, and Muslim hosts; and less than seventy years ago, some six million were murdered by the Germans and their French, Dutch, Belgian, Norwegian, Italian, Polish, Ukrainian, and other helpers. Since its inception, Israel itself has been subjected to a series of wars and unremitting terrorist assault by Arabs and their allies (the Japanese Red Army, and so on); and today it is under existential threat from a nuclearizing Iran, whose president almost daily announces the Jewish state’s imminent demise, and its regional sidekicks, Hezbollah and Hamas (and, perhaps, Syria). Right now Israel watches anxiously as Egypt is destabilized and cast into political uncertainty. So are Jewish Israelis really “paranoid,” “deranged,” or “delusional”? Or do they have very real enemies of whom they are, quite understandably, fearful? Have they really no reason to worry about what tomorrow holds in store? All of this, surely, is clear to Bird, who, after all, is married to the daughter of Holocaust survivors (it is a major motif of his book), and who devotes many of this book’s pages to her family history and to the Holocaust (though very little space to the trauma of the Jews before 1939 or in Palestine\Israel since then). Still, though he covers himself by attaching qualifications and reservations at almost every turn, the thrust of his volume is that since 1945, and in some ways even before then, the Jews have become the oppressors and the aggressors, and Palestine’s Arabs and the states surrounding Israel the innocent victims of Zionism. What emerges from this memoir-history is nothing less than a charge-sheet against the Zionist enterprise and the State of Israel going back decades and a great deal of understanding and sympathy for the Palestinians and the Arabs in general, despite their periodic missteps and iniquities, which Bird here and there reluctantly acknowledges. But the young Kai did not really grow up in Beirut or Saudi Arabia but in sheltered and sequestered diplomatic enclaves, which furnished little opportunity to observe the deep complexities in Arab societies. As a child, he never actually witnessed the viciousness, the intolerance, and the illiberalism that characterizes the Muslim Middle East. He never watched a beheading or amputation in a Saudi town square; he never saw the mangled remains of a woman after an “honor killing.” He was unaware of the hundreds, perhaps thousands, of Yemenis killed by Egyptian poison gas in the early 1960s, during Cairo’s intervention in that country’s civil war, or of the hundreds of thousands, some say two million, killed by Sudan’s Arab rulers in the south of the country or by the Arabs in northern, Kurdish Iraq. On the other hand, picturesque tent encampments peopled by tamed falcons and “authentic” and “proud” beduin in flowing white robes won his heart, as did the elegant multicultural homes of East Jerusalem’s fawning Christian illuminati. How did the Bird clan come by their prejudices? The Arab Awakening, which appeared in 1938, by George Antonius, the Lebanese-born Christian Palestinian educator and historian, appears to have played a decisive role. “Father decided to become an Arabist after reading … Antonius,” he writes—and Bird then quotes an American diplomat, J. Loder Park, as saying that “If you read the book … you will need nothing more to guide you in your work in the Near East.” That book, says Bird, “seduced at least two generations of American diplomats.” The Arab Awakening, which traced the emergence of the Arab national movements, especially the Palestinian-Arab national movement, from the “literary” societies and Christian missionary schools of nineteenth-century Beirut, Jerusalem, and Damascus through the Arab Revolt of 1916-1918 in the Hijazi desert to the post-war establishment of the imperial mandates and the rise of the countervailing local nationalisms, depicted the Arabs of the twentieth century as no more than victims of British and French imperialism, and of course of Zionism. Bird and his parents were persuaded that “the Palestinian cause was just, legitimate—and terribly misunderstood in the West.” He says that Antonius documented “how the British broke their promises to the Arabs for self-determination and majority rule in an independent Palestine”—though equally cogent arguments can be found in other books outlining how Britain gave Iraq, Egypt, and Jordan independence, and forced the French to grant the Lebanese and Syrians self-determination, and how Britain turned its back on Zionism and supported the Arabs from 1939 onwards. The pledges made to Hussein ibn Ali, the Sharif of Mecca, in 1915 were, as it turned out, eventually almost fully honored—and they never included, whatever Antonius thought and Bird thinks, Arab “self-determination” or “rule” in Palestine. The Hussein-McMahon correspondence of 1915-1916 is at best vague and inexact on this point, while Britain’s Balfour Declaration of 1917 is, by comparison, crystal clear. From this point on, to the best of my knowledge, practically nothing that Bird tells his readers about the Arab-Zionist conflict conforms with the facts of history. And I am not talking about matters of interpretation. Take the Palestinian revolt of 1936-1939 against British rule (and the Zionist enterprise). “Initially,” says Bird, “their protests were entirely nonviolent. They demanded free elections, based on majority rule … As the months rolled by, strikes and peaceful demonstrations gave way to escalating violence.” This is nonsense. From the first, from the gang-style execution of two harmless Jewish drivers on the Anabta-Tulkarm road on April 15, 1936, which marked the start of the revolt, and the subsequent chain of deadly attacks in Jaffa, there were daily shootings and minings directed against the Jewish settlers and the British rulers of the land. Had Bird simply looked at the almost daily dispatches from Palestine in the London Times from the spring of 1936, he would have discovered this. And this has nothing to do, again, with interpretation or opinion—whether the revolt was justified or wise, whether the Palestine Arab cause was legitimate or not. These are questions of fact, of historical accuracy. What’s more, in dealing with the Revolt, Bird makes an unforgivable—and tendentious—elision. He completely ignores the Peel Commission’s labors and proposals. The royal commission had gone to Palestine in November 1936, six months into the revolt, to investigate the inflamed situation. In July 1937 it proposed an end to British rule, the partition of Palestine into two polities, one Jewish the other Arab (the latter to be eventually joined to neighboring Transjordan), and the orderly, compensated transfer (and, if need be, expulsion) of Arabs inhabiting the area earmarked for Jewish sovereignty. This was the first international proposal for a two-state solution to the Palestine problem. The Jews were to be awarded 17 percent of Palestine’s land, with the Arabs getting the rest—save for the Jerusalem-Bethlehem area—with a corridor to the Mediterranean Sea via Ramle, which was to be retained by (Christian) Britain. But the Palestinian Arabs, guided by their leader, Haj Amin al Husseini, the mufti of Jerusalem and the head of the Arab Higher Committee, flatly rejected the proposal, demanding all of Palestine for Arab sovereignty. And George Antonius, who emerged as the preeminent Palestinian Arab spokesman (despite his Lebanese Christian origins), likewise rejected Peel. Bird quotes at length from Antonius’s book without mentioning Peel, and without quoting Antonius’s specious zero-sum-game argument. Antonius wrote: “No room can be made in Palestine for a second nation except by dislodging or exterminating the nation in possession”—even though Peel had only assigned 17 percent of the land to the Jews and recommended the removal of Arabs, or “the Arabs,” only from that 17 percent. Antonius, using a sleight of hand in order to persuade his readers of the immorality of the Peel proposals, implied that the proposed settlement involved the complete dispossession or extermination of Palestine’s Arabs. Right. A multinational, multicultural paradise, oiled by tolerance and democracy—for which the Arabs were then, and are today, famous—with an undefined Jewish minority whose size the Arabs would determine in line with their “political” and “economic” calculations. This was what Antonius was selling to his English-speaking readers in the United States and Britain—while back home, in Palestine, intolerance ruled, as Husseini’s gunmen shot and knifed their internal Arab opponents and “moderates” (as well as Jewish farmers and British soldiers). At the same time, and perhaps there is a hint of an echo of this in Antonius, Husseini promised the expulsion (if not worse) of the majority of the 400,000-odd Jews who were already living in the country. Had Husseini—and Antonius—won, the fate of Palestine’s Jews most likely would have resembled that of the Jewish inhabitants of the rest of the Arab world. There are no Jews left in Baghdad, Cairo, Alexandria, Aleppo, Damascus, Tripoli, and Algiers; and Jewish “values” and “Jewish genius” are little in evidence in those cities where once there had been thriving Jewish communities. Bird’s treatment of 1936-1939 is ventriloquistic, and a major distortion of history. He camouflages a fanatical, intolerant, and violent Arab leadership with an apparently reasonable (and certainly eloquent) voice—Bird calls Antonius “a bridge between two different cultures and an agent in the interpretation of one to the other”; and then goes on to charge the Jews with immoderation and extremism. He quotes David Ben-Gurion as saying: “We will expel the Arabs and take their place”—a somewhat problematic quote that I once used myself, but then stopped using, because it involves a letter, from 1937, not “1936,” which has several key words crossed out, and it is unclear by whom, leaving the phrase “we will expel …” In any case, its thrust was never adopted by the Zionist movement, or by Ben-Gurion’s own party, as ideology or policy, though, to be sure, expulsionist Arab thinking and murderous Arab behavior ultimately persuaded many, and perhaps most, Zionists, including Ben-Gurion, a decade later that it were better, indeed, necessary, to see their neighbors off the premises. Bird tops off his treatment of the Arab Revolt with a staple of Arab propaganda since 1945: the claim that Palestine’s Arabs were being made to pay the price for Europe’s persecution and mass murder of the Jews. Again, he quotes Antonius: “The treatment meted out to the Jews in Germany and other European countries is a disgrace … [But] to place the brunt of the burden upon Arab Palestine [through Jewish immigration] is a miserable evasion … No code of morals can justify the persecution of one people in an attempt to relieve the persecution of another.” As if awarding 17 percent of Palestine for Jewish sovereignty—which would have provided a safe haven for multitudes of persecuted Jews from Europe during the following years—was tantamount to the “persecution” of Palestine’s Arabs! Antonius died a sick and broken man in 1942: His wife, the vivacious Katy, had divorced him (she later became the mistress of the British military commander in Palestine, General Evelyn Barker, not exactly a commendable Arab nationalist position), he had lost his job in the Current World Affairs Institute, and he had no pension. Bird laments the passing of the man who had made “the case for a multicultural Palestine to the West”—but concedes that given the mindset of the two peoples, it couldn’t really have been made successfully. Bi-nationalism may have had few, if prominent, Jewish supporters at the time (Martin Buber, Judah Leib Magnes, Gershom Scholem), but it had none at all in the Arab camp. Jump-switch to the 1950s and here again we have Bird vilifying the Israelis and getting most of it wrong. Before 1956, he tells us, the Egyptian leader Gamal Abdel Nasser wanted peace and “asked for minor territorial adjustments along the Sinai-Israeli border. And they said they needed a land link through the southern Negev to Jordan.” But “negotiations commenced in earnest only after” the moderate Moshe Sharett took over from the hawkish Ben-Gurion as prime minister in late 1953. The Egyptians were willing to accept compensation instead of repatriation as a solution to the Palestinian refugee problem, but then the dastardly Israeli defense establishment muddied the waters with “Operation Shoshanah,” the plot to blow up Western installations in Egypt in order to prevent the planned British evacuation of the Canal zone—or, as Bird speculates in a very Middle Eastern way, “the implementation of Susannah [Shoshanah] may have been specifically designed to scuttle Nasser’s secret talks with Sharett.” And yet “a window to a real peace settlement was still open in 1955. In Nasser, Israel had a popular Arab leader who was willing to shoulder the political risks of dealing with the Jewish state … He undoubtedly would have insisted that Israel … agree to recognize the 1948 [sic, should be 1949] armistice lines as final borders.” But alas, Nasser was stymied by the return of Ben-Gurion to power, first as Defense Minister in February, then as prime minister. Israel reverted to militancy and the chance for peace was lost. Moreover, Operation Shoshanah had led to resurgent anti-Semitism in Egypt and massive Jewish emigration from the country. Nasser, in a number of unsigned missives and oral transmissions through third parties between 1952 and 1955, hinted at a willingness to enter into a peace process in exchange for various economic and political benefits (for example, Israeli help in persuading the British to evacuate Egyptian soil). He and his emissaries always said Egypt wanted all or large chunks of the Negev, and not “the armistice lines,” as final borders. (Where on earth did Bird get this from? Not even Avi Shlaim, whose Iron Wall is highly sympathetic toward Nasser, makes such a claim.) But Nasser never offered Israel “peace,” and he was not interested in Israel’s continued existence or in peace, which in any case he probably felt unable to deliver as it would have raised hell in the Arab world, which he sought to gain leadership over. Getting the British out was his main foreign policy priority. Confronting Israel militarily, while his army was weak and while British forces sat astride his lines of communication eastward, was not an option. At the same time, maintaining relative quiet along the Israeli border while making pacific noises in order to keep Washington and London happy made perfect sense. Operation Shoshanah and the Israeli raid on Gaza in February 1955, both of which Nasser always trotted out as reasons for his subsequent belligerence toward Israel, probably had very little to do with the substance of his policies between 1954 and 1956 (though the latter incident without doubt prompted him to energetically pursue Soviet armaments). And Egyptian Jews steadily left the country in the years following Egypt’s attack on Israel in 1948 (many hundreds of prominent Jews were incarcerated and fined by the Egyptians, and there were a series of murderous attacks on Jewish pedestrians and businesses during that war)—and following the Israeli-British-French assault on Egypt in 1956. There was no wave of emigration following Operation Shoshanah: this is pure invention. 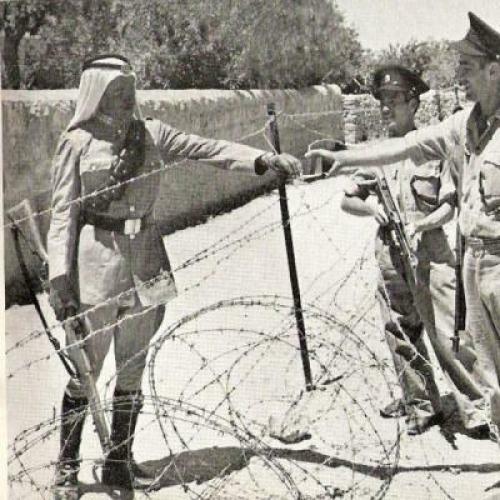 To be sure, between 1949 and 1956 the infiltration into Israel by Palestinians, mainly 1948 refugees living in the West Bank and Gaza, was a source of constant Israeli-Arab friction. There were many thousands of such illegal border crossings each year, most of them for economic and social reasons—to reap crops, to recover goods, to visit relatives, to resettle in former villages, to steal. But alongside these individual incursions there were a very small number of terroristic infiltrations. Much of this terroristic infiltration, certainly from 1954 on, was organized by the Egyptian government. The fedayeen units were recruited, organized, and sent on their way, from 1954, by Colonel Mustafa Hafiz, who headed the Egyptian army’s intelligence bureau in the Gaza Strip. Yet Bird writes: “[Nasser] … allowed Palestinians in Gaza to organize irregular guerrilla units called fedayeen—self-sacrificers.” Israel responded to fedayeen strikes in 1954-1956 with retaliatory raids, almost exclusively targeting Jordanian and Egyptian military and police facilities. The Jordanians killed in al-Rahwa and Gharandal were all soldiers and policemen; in Hussan, thirty-seven of the thirty-nine Jordanian dead were soldiers or National Guardsmen. Bird then tells us: “In early October the Israeli launched three heavy attacks, destroying four Jordanian police stations and killing over a hundred men.” Actually, during October the Israelis attacked only once, hitting the Jordanian police fort at Qalqilya on the night of October 10—and Bird is simply adding the attacks on the Rahwa, Gharandal, and Hussan forts to the one in Qalqilya to give us “four.” In only one case, in Hussan, does Bird bother to explain what triggered the Israeli strike (the soldier who fired at the archaeological get-together)—but then he explains it away by stating that the soldier was motivated by a prior Israeli attack in which his brother had been killed. (I don’t know whether this is true.) Israeli reports at the time claimed that more than one Jordanian gunner had participated in the massacre, in which another sixteen Israeli civilians had been wounded. And the Israeli attack on Hussan was also provoked by an infiltrator attack against a mother and daughter near Jerusalem; the mother was wounded and the daughter was murdered, one of her arms being taken back to Jordan by the killers as a trophy. In sum, Bird manages almost to double the number of actual Israeli reprisal raids against Jordan in September-October 1956, and to switch their targets from soldiers to civilians, with all that this implies in terms of blackening Israel’s name. About the Sinai-Suez War of 1956, Bird makes little effort to differentiate between Israel’s motives for going to war and those of France and Britain. The Western democracies (and empires) wanted to recoup their position in the Middle East, which had been undermined by the removal of Britain’s troops from Egyptian soil and Egyptian President Nasser’s nationalization of the Suez Canal, owned by France and Britain (who had built it). Moreover, as regards France, Egypt had “sinned” by assisting the FLN revolt against French rule in Algeria. As to Israel, Bird cites his mother: Israel had fired first, “unprovoked by ‘any armed military attack’ … She knew that the Israelis cited the hundreds of ‘incidents’ along the armistice lines as provocation enough. But the ‘incidents’, she thought, were both inevitable and not sufficient to justify preemptive war. ‘They surely cannot hope that the thousands of refugees who sit outside of their homeland can be completely kept in check.’” But Bird, never mind “mother,” makes no mention at all of the very basic casus belli presented by Egypt—the closure of the Suez Canal and the Straits of Tiran to Israeli shipping (recognized international waterways closed in contravention of international law), the Egyptian organization and dispatch of the fedayeen into Israel, and the Egyptian arms build-up of 1955-1956, which the Israelis regarded as minatory and provocative. Surely, a fair accounting would at least mention these factors. I won’t belabor Bird’s treatment of the Six Day War, but here too specious revisionism holds sway, with the Arabs—again, Nasser’s Egypt—portrayed as hapless victims. The Soviets in early May misinformed the Egyptians that Israel was massing troops along the Golan Heights to attack Damascus—and Nasser “chose to believe” them, says Bird. (Actually Nasser sent his army chief of staff to Damascus to check the information—and, within hours or days, knew that the Soviets were lying.) Yet Nasser pushed his troops into Sinai—“50,000” Bird says; but the real number was twice that—“to deter the Israelis from attacking Damascus.” Israel was forced to mobilize its reserves and to keep them mobilized, crippling its economy, until war was launched. It was UN Secretary General U Thant, not the Egyptians, who “explicitly” ordered the UN peace-keeping force that buffered between Israel and Egypt to evacuate Gaza and Sharm al-Sheikh. And somehow, according to Bird, Israel was to blame for Nasser’s closure of the Straits of Tiran to Israeli shipping, as Israel “had never negotiated [its] rights [of passage through them].” So there was “no cause to rush to war,” concludes Bird. Errors liberally spatter the book’s other pages. Tom Wasson, the American consul-general in Jerusalem, was shot dead in May 1948 “apparently by an Israeli sniper,” writes Bird. Actually, he was shot by an Arab. Bird says that the Soviet Union was “the first [state] to recognize … Israel.” Actually, it was the United States. Bird says that Ben-Gurion proclaimed Israeli statehood on “15 May 1948.” Actually, it was on May 14. And so on. The Cairo-born Yasser Arafat, the Palestinians’ national leader from the late 1960s until his death in 2004, famously regarded the Jews as a religious community, not a “people.” It was a view, of course, which ideologically facilitated his denial of the legitimacy of Jewish statehood and his desire to supplant Israel with “Palestine.” In this connection, Arafat often spoke of his first encounter with “Jews,” as a child in the 1930s, when visiting his uncle in the Old City of Jerusalem. The “Jews” were the bearded, caftaned, pale-faced worshippers who wended their way through its alleyways to pray at the Wailing Wall. Like Arafat, Bird seems to believe that the Jews are not a people, but only people of a certain religious persuasion, albeit—he sometimes concedes—biologically descended from people who called themselves “Jews.” It is a misapprehension difficult to fathom in a man married to a daughter of a Holocaust survivor. For Bird, French Jews are Frenchmen of the Mosaic faith, American Jews are Americans of the Mosaic faith, and so on. Translated by Bird into the small, but deadly, change of politics, what the author is telling us in the final pages of his book is that Israel is not, and should not be, the land or state of the Jews. Instead he posits the emergence of a new “Hebrew Nation” and Hebrew “republic.” This would, in his view, resolve the Arab-Israeli conflict. The people living in Israel, Jews, Muslims and Christians, who speak Hebrew, would henceforth constitute, in Bird’s vision, this new “Hebrew nation”—and their state is the “Hebrew Republic.” Thus Arabs, Muslims, or Christians, would cease to feel “second class” or outsiders and the Arabs surrounding the “Hebrew republic” would no longer resist or resent the polity which was once “Israel.” Unknowingly, Bird is merely resurrecting the vision of the “Canaanites,” or “Committee for the Formation of the Hebrew Youth,” of the 1940s, the small group of Palestine Jewish intellectuals who hoped for and advocated the abandonment of Jewish and Arab identities and the emergence of a new “Hebrew” nation, composed of ex-Jews and ex-Arabs (who could retain their religious identity as Jews, Muslims or Christians), in Palestine. They harked back to the ethnic groupings that inhabited the land (“Canaanites”) before the arrival of the Jews or Arabs. The Hebrew language, and the culture surrounding and emanating from it, would serve as the basis of the new “national” identity. Three decades on, Bird remains “convinced that Kook’s ideas about Israeli identity are essential to any lasting resolution of the [Israeli-Palestinian] conflict.” The abandonment in Israel of Jewish identity and, he implies, of Arab identity, will rid the conflict of its aggravating religious elements and make possible the emergence of the new secular “Hebrew” identity and polity, in which the lions will lie down with the lambs. Bird’s vision rests on the very shaky premise that both Arabs and Jews in large numbers will be willing to shed their national identities and their memories of everything that has happened in the last hundred years. Curiously—and the book is full of contradictory notions—a few pages later Bird briefly introduces the Nusseibeh-Ayalon peace plan of 2002, which provides for a two-state solution, with a Jewish Israel and a Palestinian Arab West Bank-Gaza state. And at the same time Bird endorses at least a limited Palestinian refugee return. “If I were either Israeli or Palestinian, I would endorse [the Nusseibeh-Ayalon plan],” he says. He is geopolitically bewildering. But Bird’s two-state segue is really only a momentary diversion. The political thrust of Crossing the Mandebaum Gate is clear. Bird concludes the book with this peroration: “My friends—Israelis, Palestinians—call me naïve … I plead guilty … But the realists have failed.” So may the Mandelbaum Gate—the crossing point, from 1949 to 1967, just north of the Old City, between Arab East and Jewish West Jerusalem—be no longer a symbol of partition and a barrier, and instead become a bridge between Israeli Jews and Palestinians, “a reminder that … divisions cannot last forever.” When he was seventeen, Bird tells us, he wrote a school essay (he was then in India, another partitioned land), citing Antonius and I.F. Stone, propounding the case for a binational state. A binational state would mean, at the very least, the disappearance of the Jewish state. This seems to be, politically, what Crossing Mandelbaum Gate is really about.